Clear but tasty beef ball soup, originally uploaded by Camemberu. Thanks to ieat's intriguing post, I made an effort to come to Syed Alwi Road to sample what is probably Singapore's only version of Hakka-style beef balls that are still laboriously handmade. The soup here is very cheng (light and clear) but I fancy it is no less tasty. Those who like strong, pungent-flavoured foods may not take well to it at first though. The beef balls themselves are huge and meaty but not as tough as rumoured. They yielded easily enough to the bite, but you can sense the tensile bounce as your teeth sink in. 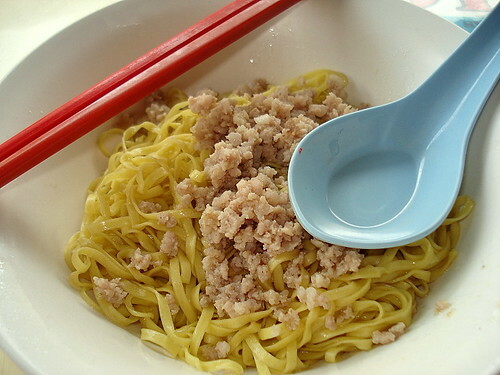 Mee Kia (thin noodles) with savoury minced pork, originally uploaded by Camemberu. The other reason I had to come here was the Hakka-style mee kia (a really thin linguini?). 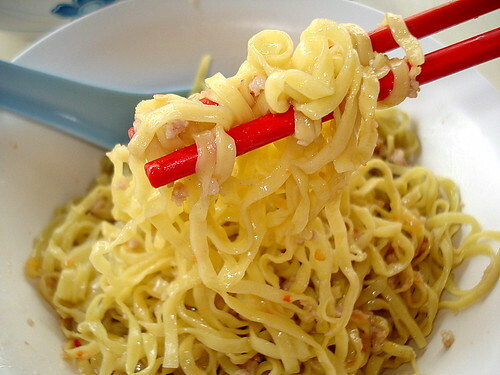 I absolutely love this type of noodle! Maybe it's me, but I rarely come across this type of thin noodle (only other place I know that offers it is the Koo Kee Yong Tau Foo chain - anyone else know of others?). Beef House also has other types of noodles, of course, ranging from kway teow to mee pok. You can have it soupy or dry. QQ noodles!, originally uploaded by Camemberu. The noodles themselves are very QQ (good al dente bite) but slightly dry and bland (which is all right, still better than soggy and oily). The flavour comes from the tasty minced pork. The beef soup also complimented the noodles well. You can also stir in some of the potent chili sauce - lots of garlic, chili padi and rice wine in there! 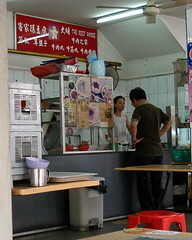 This place also sells yong tau foo (YTF), similarly reputed to be good. I'm not a big fan of YTF but I might try it some day. Hakka abacus seeds and soon kueh (turnip dumplings) are available as well, both of which I was too full to sample. Only after looking at an old newspaper clipping (Teo Pau Lin's article) did I realise this is the a branch of same outfit at Joo Chiat (much closer to home)! Oh well, I know where to get my fix now. I had the one at Joo Chiat before as I used to work near that area. Yes, didally, the soup is quite tasty (only problem is - I'm hungry again four hours later)! Haa, I missed that Stephen Chow movie. Must look for it. He also went to search for the movie. Haha..
ask anyone from ntu and they'll tell you that these are the best beef balls ever! I love Hakka noodles too! There's a stall selling "handmade yong tao fu" koo kee style ($3 for noodles and 6 pcs) at Ang Mo Kio 724 food centre near where I live. I like the soft tofu, but give the other ingredients a miss.